<h2 style="color: #045394; margin-bottom: 7px;">Advance Your Legal Research</h2><p style="margin-top: 0; margin-bottom: 7px;"><img src="http://images.wisbar.org/Images/DigestEmails/FastCase_175w.jpg" alt="" width="175" height="79" align="right"/>In <a href="http://www.wisbar.org/NewsPublications/BarBriefs/Pages/BarBriefsArticle.aspx?MKTID=MKT474e">last week’s issue</a>, we explored how the Fastcase online law library can make your legal research faster, easier, and more personalized. Now let’s discover how the advanced features of this valuable member benefit can take your research to a whole new level. 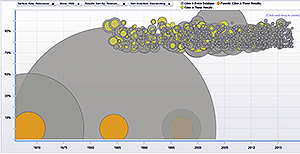 </p><p style="margin-top: 0; margin-bottom: 7px;"><strong>Citation analysis</strong> </p><p style="margin-top: 0; margin-bottom: 7px;">Fastcase’s integrated citation analysis tool, Authority Check, helps you prioritize your research by identifying frequently cited cases within your search results. <p style="margin-top: 0; margin-bottom: 7px;"><strong>Enhanced search results</strong> </p><p style="margin-top: 0; margin-bottom: 7px;">The Forecite tool in Fastcase identifies important cases you might miss in a basic keyword search. It does this by looking for decisions frequently cited by other decisions that already appear in your search results, but don’t contain all of your search words. These additional cases show up inside an orange banner alongside your original search results. <p style="margin-top: 0; margin-bottom: 7px;"><img src="http://images.wisbar.org/Images/DigestEmails/Fastcase-graphic_300w.jpg" alt="" width="300" height="154" align="right"/>The chart makes it easy to spot the most recent, relevant cases from among your search results. <p style="margin-top: 0; margin-bottom: 7px;">According to Jeena Cho, a Legal Mindfulness Strategist, in her post <a href="http://jeenacho.com/2017/08/13/want-find-balance-contentment-start-small/"><em>Want to Find More Balance and Contentment? Start Small</em></a>, the key to achieving better balance and more happiness is incremental change. It’s as simple as reallocating a small portion of your time for yourself and committing to that change every day. Here are some suggestions to get you moving toward a more positive life. </p><p style="margin-top: 0; margin-bottom: 7px;">You don’t need to take radical steps to effect change in your life and cultivate happiness. Instead, look to make small changes. This could be as little as a few minutes a day or as much as 30-40 minutes. Pick one of these activities, stick to it for 21 days, and see how you feel afterward. 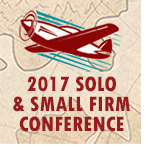 <p style="margin-top: 0; margin-bottom: 7px;">The State Bar’s <a href="http://www.wisbar.org/forMembers/Groups/Sections/SoloSmallFirmandGeneralPracticeSection/pages/home.aspx">Solo/Small Firm & General Practice Section</a> is offering a limited number of scholarships to the 2017 <a href="http://www.wssfc.org">Wisconsin Solo &amp; Small Firm Conference</a>, which will cover the cost of conference tuition. Recipients are responsible for travel and lodging costs. </p><p style="margin-top: 0; margin-bottom: 7px;">All solo and small-firm attorneys are eligible to apply, but preference will be given to those who would otherwise be unable to attend the conference due to financial constraints. </p><p style="margin-top: 0; margin-bottom: 7px;">WSSFC scholarship recipients are expected to “pay it forward” through volunteer service. That service can take the form of assisting with WSSFC planning or serving on either the Solo/Small Firm & General Practice Section board or a board subcommittee. </p><p style="margin-top: 0; margin-bottom: 7px;"><strong>Scholarship applications are due August 18</strong> and can be sent to Terry Dunst at <a href="mailto:tdunst@bakkenorman.com">tdunst@bakkenorman.com</a>. Download the application <a href="http://www.wisbar.org/wssfc/2017/Documents/SSFGP%20Scholarship%20application.pdf">here</a>. </p><p style="margin-top: 0; margin-bottom: 7px;">Recipients will be notified by September 20. <p style="margin-top: 8px; margin-bottom: 7px;">The start of a new semester in law school brings mixed feelings: a fresh start, a clean slate – along with a quick realization that law school is still challenging and stressful. Take comfort in knowing there are countless people at your law school and the State Bar of Wisconsin who are invested in your success and well-being. </p><p style="margin-top: 0; margin-bottom: 7px;">The Wisconsin Lawyers Assistance Program (WisLAP) is a safe place to turn for free, private help. WisLAP is confidential by Supreme Court rule. The program does not report to the school, the Board of Bar Examiners, or the Office of Lawyer Regulation.